I honestly cannot believe that 2017 is half-way over, how did that even happen? 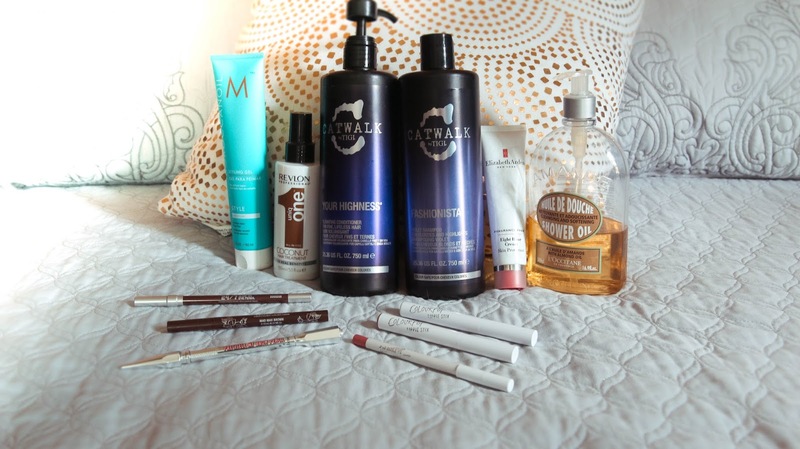 However I am excited to share my May favorites with you guys, as I tried out some pretty cool stuff this month. First we have the MoroccanOil Styling Gel. I use about a dime size amount just before blowdrying and it helps tame the frizz, as well as add some much needed texture to my hair, without being drying. I use the Revlon Professional Uniq One Coconut Hair Treatment right after washing my hair. this helps detangle it, as well as provides heat protectant for when I blow-dry and straighten. Catwalk Fashionista Shampoo is a very pigmented violet shampoo that can be used as an at home toner as well. The sent is amazing as well. The Catwalk Your Highness conditioner is a heavy enough conditioner to really hydrate your hair, without being so heavy that your hair feels greasy. The Elizabeth Arden Eight hour Cream Skin Protectant is amazing on chapped lips and sunburned noses, the website says you can use it on dry rough skin like your elbows, I don’t care for the heavy feeling there but it may be fine for you. The L’Occitane Shower Oil is incredible! I love the scent and the way it feels on my skin. It doesn’t lather a lot but I don’t mind. It’s perfect for shaving as well. I have always loved the Urban Decay 24/7 Glide On Eyeliner, but I purchased in brown because I wanted to create softer looks and this did not disappoint. As I mentioned I wanted slightly softer looks and so I also added the Kat Von D Tattoo Liner in Brown and it looks so great. Adds that bit of dimension I’m looking for, without looking too harsh for the daytime. Because I went blonde in May I wanted a darker brow pencil, as blonde hair can sometimes wash you out, and darker brows pulls your face forward again. 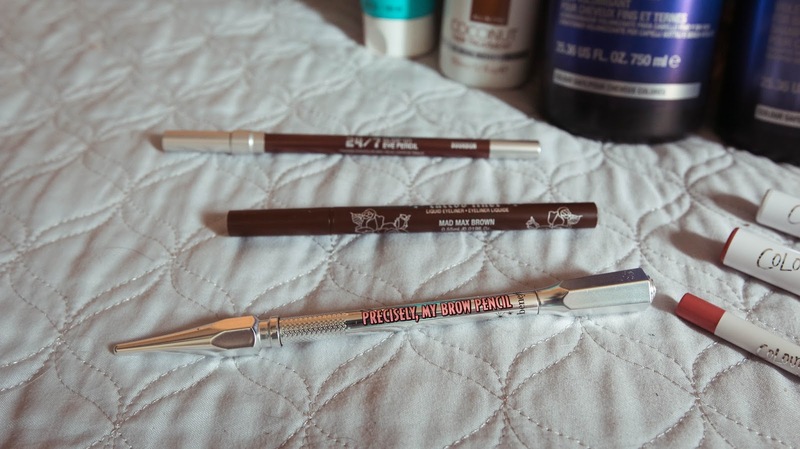 I went with the Benefit Precisely, My brow Pencil, and I love it. It has amazing staying power through the day, but goes on so soft and smooth. 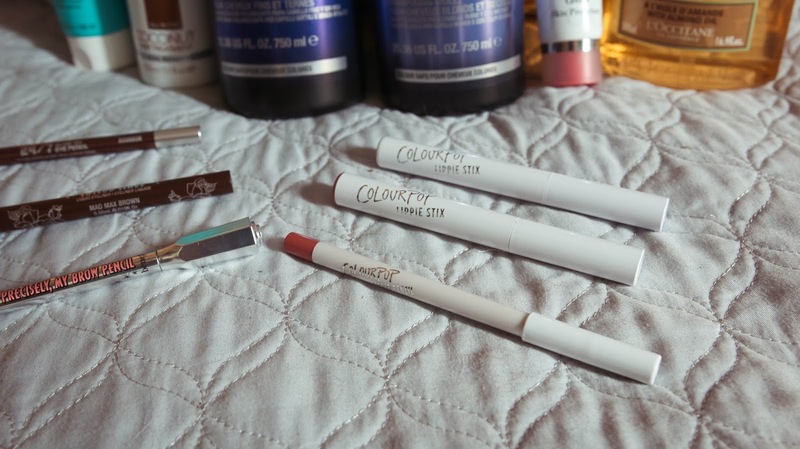 Finally this month I have been loving the ColourPop Lippie Stix Set in Lumiere, as well as the lip primer. They primer works wonders, the lip pencil is really soft and goes on smooth and the Lippie Stix is matte but not dry. That is everything I have been loving in the month of May, you can watch the video for this post here, it includes the winners of the 10K giveaway. I would love to know what your favorites were in the month of May. I love the price of the the lippie stix, its crazy that you can get such a good formula for such a low price.